Western meets horror for this riveting story about survival, family, and inner strength. Tense, short chapters propel readers from one action-packed scene to the next, while Willie’s distinctive, introspective voice deepens the emotional stakes with every turn of the page. High concept and character-driven, Emma Berquist’s debut will satisfy fans of The Magnificent Seven, Rae Carson’s Walk on Earth a Stranger, and HBO’s Westworld (goodreads). Devils Unto Dust was a zombie book with a lot of heart. 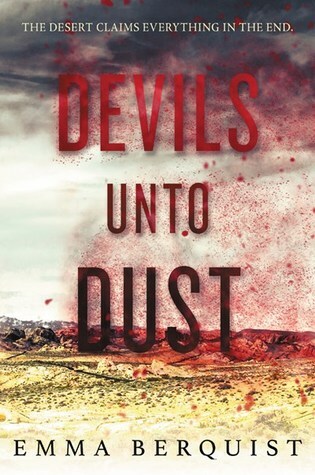 Plot: Devils Unto Dust was an impressive debut that did so much more than your average zombie book! Daisy "Willie" Wilcox was tasked with looking after her younger siblings after her mother fell to a sickness and her gambling, drunk father disappeared into the night. When two men threatened her family over a sum of cash that Willie's father stole, she headed out into the unforgiving desert to drag her useless father home and pay for his mistakes. The novel was told from Willie's perspective and I became invested almost immediately. The story moved at an engaging place and left just enough unsaid to have me wanting more. Unexpectedly, Devils Unto Dust was a very emotional book. It explored Willie trying to care for her family, keep her mother's memory alive, and just survive. If I had to compare this book to anything, I would definitely say that it gave me major Walk on Earth a Stranger vibes, just add zombies! Characters: Much like Walk on Earth a Stranger, Devils Unto Dust was a character-driven read. This isn't to say that Devils Unto Dust was a slow read, but it was easy to fall in love with Willie and her crew and really cross your fingers that they would make it home alive. Willie was strong, stubborn, and sasssy - everything you could hope for in a female main character. Her relationship with her siblings was what you would expect of an older sister trying to fill a parental role and her desire to protect them was admirable. To make this dangerous trek, Willie enlisted the help of two hunters, brothers Curtis and Ben. Curtis was nothing but sunshine and smiles while his brother was long stares and brooding. Can you guess the ship? The romance was there, but very subtle, which I guess was realistic given that there were zombies out to eat them. Worldbuilding: Devils Unto Dust was a satisfying conclusion but I would have loved to explore more of this world. Like I mentioned earlier, Devils Unto Dust gave you just enough to make you want more. There was no explanation as to where this sickness came from and our view was fairly limited; we only explored a few Western towns with no explanation as to how other regions of the budding United States were dealing with the outbreak. There was also the acknowledgment of how people came into authority and used fear to control people. Short N Sweet: Devils Unto Dust was so much more than I was expecting; I want everyone to read and fall in love with Willie like I did!